A month back, we went down to visit the southern part of Tamil nadu (a state in India). There, we had visited the memorial of my child hood hero. His name is Kattabomman. He was and still an ideal guy who defines braveness, he was a person who lived by his principles. He didn’t jump out of the sky. All he did was to manage a small province in the southern most part of India. India being under the British rule that time, he was asked to pay tax for his province. Despite the fact that Indians owned the land and ploughed the field and did all the hard work, the British asked for tax from his province. Unable to put up with the atrocities of the British rule, he stood against it and recorded his decision of not paying tax. Even though, he owned a small province and all the big players of his time played by the rules. He was strong about his decision and decided to stand by it no matter what. The British reign got scared of his approach and decided to put a stop to this. As a result, a war was waged. 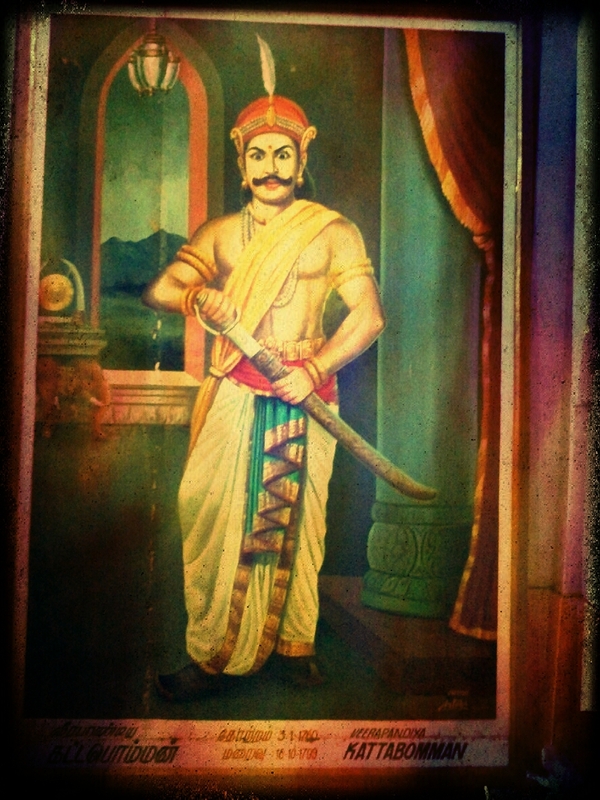 Kattabomman was captured and decapitated. His story was a strong motivation to lot of people and the first seed of independence was seeded in Indian soil through his death. Well.. He believed in something. Nothing that could fall from the sky. But just a firm belief in his principles and that made him risk everything he had. I’m not saying what ever he did was right. I really wouldn’t appreciate someone who is willing to wage a lost war and thereby killing the hopes of his subjects just because to prove a point!! All said and done. 200 years has passed since he died. But still, his generations remember him, they still adore him, they are still proud of the fact that they belong to a community that taught the world about braveness.. I came out of the memorial place with a heavy heart. Visiting a place of my child hood hero, made me think a lot about my view point in life. Seriously.. What are we really doing in this life?? With some polished words around, we say we follow our passions, we live our dreams. But do we really believe in anything for that matter? We say we are passionate to follow our dream and move on to become an entrepreneur, before even we visualize our dream, we are framing out our exit strategy! We say this is the person of our dreams and we dream of living an ideal life with this person. And before we step into marriage, we are more engrossed in getting it annulled to cut down the losses! We say honesty is the best policy and yet ridicule the honest folks as losers! We preach people to stand by what they believe in and yet we tell them that they need to know when to cut down their losses and run away! Isn’t a dream or a stand point in life mean that we stand by our principles and beliefs no matter what? If my stand point keep changing now and then saying this is a sinking ship and that one isn’t? Is this really a “real” way of living? What are we really bench marking our life against? Is it really smartness when we don’t have the guts to stand up for what we believe in? Is it really the so called great way of living when we can’t even dream a dream? I’m not saying it’s necessary for us to give up our life to prove a point on what we believe in, but atleast do we have what it takes to live our life to atleast 50% of what we believe in?? Yup.. Been blogging on and off..